Hey! Thanks for stopping by! 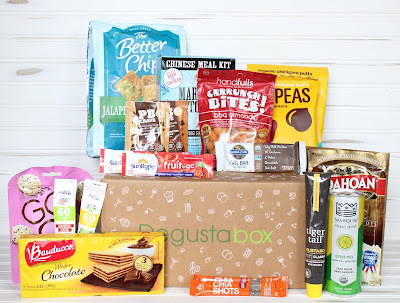 September's Degusta Box USA is themed "Lunchbox." It's full of goodies that help me pack delicious, healthy snacks into my lunch or my son's lunchbox. 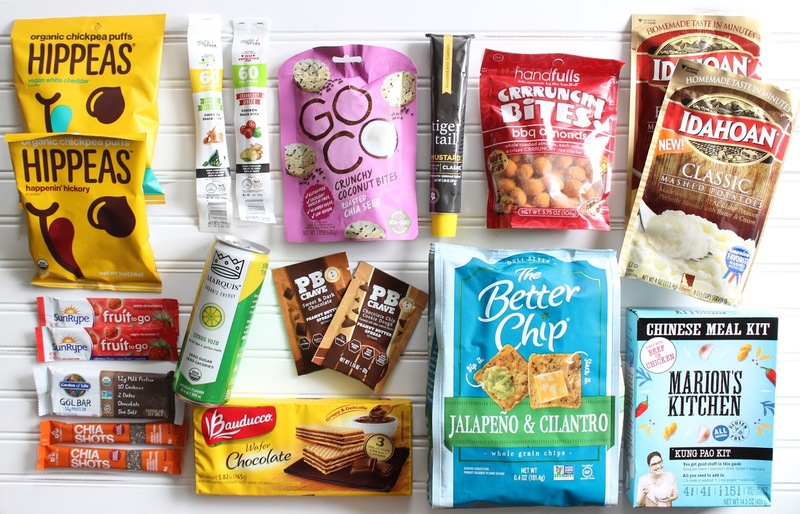 Each month, Degusta Box USA sends me a box of 9-14 full-sized foods or drinks. Every month, the products are a complete surprise. My family and I enjoy opening it up together to see what we got. My kiddos immediately want to dig right into all of the yummy snacks. Garden of Life makes delicious, simple protein bars that are Organic, Kosher, Vegan, non-GMO and gluten-free. These bars are made with clean protein. I got the chocolate sea salt flavor in my box. After taking my first bite, I was wowed at how soft and light this bar is. I can really taste the sea salt and the chocolate. I love how this bar is high in fiber and low in sugar. It's a really good protein bar. Bauducco Chocolate Wafers are made with airy wafers and 3 layers of creamy chocolate. I use to eat these wafer cookies all of the time when I was young. So, I really enjoyed these. Brought me back to my childhood. I love enjoying these wafers with a hot cup of coffee. SunRype Apple Strawberry Fruit to Go 100% Fruit Strips are made with only fruits and veggies. These fruit strips are my sons go-to for an after school snack. They're chewy, fruity and just so flavorful. My sons love these! Hippeas Chickpea Puffs are an organic snack. These puffs are vegan, gluten-free, non-GMO, soy-free and nut-free. The puffs are super crunchy. The White Cheddar flavor is super cheesy. The Happenin' Hickory flavor has a smoky BBQ taste. The Better Chips are whole grain chips that are made with fresh veggies and herbs. The flavor that came in this month's box was Jalapeno& Cilantro. Boy, do these chips have a spicy kick to them! I love them though because I love spicy foods. The Better Chips pair well with a cold guacamole or a slice of cheese. Tiger Tail's Medium Style Mustard comes in a tube! This German recipe is made with stone ground mustard seeds, craft flavor and a bit of heat. I love adding this amazing mustard to the top of a hot dog! I really is a mustard like no other. Handfulls Crrrunch Bites are half nut, half chip. The almonds are wrapped in a crispy rice cracker and they are just so good! This was my first time trying these and I was blown away. I really enjoyed the BBQ flavor. Marion's Kitchen Kung Pao Meal Kit is a Chinese stir-fry that can be made in my very own kitchen. These meal kits are all natural and all I needed were a few ingredients in order to cook a yummy meal. The Kung Pao kit was a bit spicy and also sweet. I had a healthy meal cooked for my family in under 15 minutes. And, they loved it! PB Crave makes the best flavored peanut butters. They are sweetened with real honey and they are made with real ingredients. In my box, I got 2 different flavors: Chocolate Chip Cookie Dough & Sweet & Dark Chocolate. I really liked them both. This peanut butter is really good on graham crackers. GoCo Crunchy Coconut Bites are made with real coconut pieces. They are gently toasted and then pressed into bite sized discs. I really enjoyed these because they are very lightly sweetened. The bite size pieces are crunchy and contain chia seeds. Idahoan Foods Mashed Potatoes are always stocked in my kitchen. These yummy potatoes are extremely easy to make. I enjoy eating them alone and as a side dish. I really enjoyed the new Classic flavor. The potatoes taste just like homemade. The Four Cheese flavor is one of my favorites. The Chia Company makes pure, clean, sun ripened chia seeds. I really like the individual packages because it allows me to take the chia seeds on the go. I love adding the chia seeds to my yogurt or morning smoothie. Gives them a little added touch of deliciousness. Mighty Spark Food Co. makes one of the nest tasting snack sticks. I was amazed by how moist, juicy and flavorful these sticks are. The cranberry flavor tasted just like cranberry and had chunks of cranberry and ginger in it. The jalapeno one could have been a little bit spicier. When I think of jalapeno, I think HOT! But, I loved that one, too! Only 60 calories per stick! Marquis Citrus Yuzu is an energy drink that has zero calories and zero sugar! I normally don't like energy drinks, but I must say, I really enjoyed this one. It's light and fizzy! The September "Lunchbox" Degusta Box is my all time favorite. This box was just absolutely stuffed will all the things I love. Snack sticks, coconut, almonds, mashed potatoes, tortilla chips and peanut butter. My go to products from this month's box is definitely the chip coated almonds and the coconut bites! It had a great variety of snacks and a lot of the brands were new to me. The cost: Only $19.99 a month. These is also a box available to those who are in the UK! Subscribe today HERE and save 50% off of your first box! Total cost of products in September's box: $41.78!! Our kitty loves the Degusta Box, too!